Dhaka – German company Veridos has been awarded with implementation of Bangladeshi project for introduction of next generation electronic passports and border control systems. Director General of Bangladesh’s Immigration and Passports Department Major General Masud Rezwan and chief executive officer of Veridos Hans Wolfgang Kunz signed a deal Thursday in Dhaka to implement the nearly 550 million dollar project. Veridos, world-leading identity solutions provider, will be responsible for supply, installation, and implementation of Bangladesh’s electronic passports and border control systems for 12 years. The contract covers the entire value chain for e-passports – from security paper right through e-gates, set up of local passport factory with high-tech equipment, according to a press statement by the company. The project will ease travel for Bangladeshi citizens and increases border control efficiency. Bangladeshi Home Minister Asaduzzaman Khan and Minister of State at the German Federal Foreign Office Niels Annen, who arrived in Bangladesh on Wednesday, witnessed the signing of the deal in Dhaka. Dhaka and Berlin in February signed a memorandum of understanding (MoU) for implementation of the e-passport project styled ‘Introduction of e-Passport and Automated Border Control Management in Bangladesh’. “Through the signing of the agreement, we’re moving towards a step ahead,” Khan said. The German minister said Bangladesh will gain crucial expertise to prepare it for various challenges including fighting counterfeit ID documents or terrorism through the technological partnership with Germany. 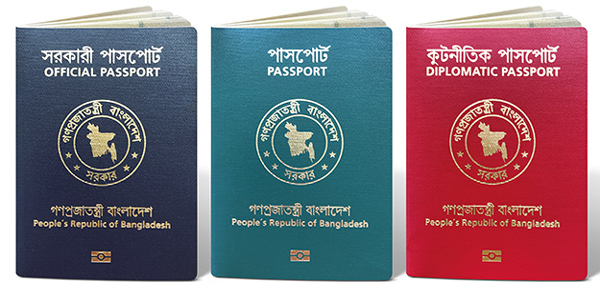 “As a result of our cooperation, Bangladeshi passport holders will soon become the owners of one of the most sophisticated and secure types of passport in the world,” Annen added. Veridos CEO said In addition his company will provide public key infrastructure and local document production. “At the same time, we will establish state-of-the-art border control infrastructure including our VeriGO® verification platform and the set-up of 50 eGates for automated border control at all international airports, seaports, and land ports in the country,” he added. Bangladesh government will finance the entire project, according to a meeting of the Executive Committee for the National Economic Council headed by Prime Minister Sheikh Hasina.